I know I've said it before, but breakfast is totally my jam. I would join breakfast committees. I would hold meetings in support of the day's fairest meal. I would lobby for the advancement of breakfast. Okay, maybe except instead of advancement, it would really be just wanting pancakes and sausages and stuff. So it would be more of a "in support of traditional breakfast" type thing, but also in support of every other breakfast, and maybe mandating that breakfast always happens. I don't know. The details can be worked out later. One detail that doesn't need to be worked out is that dessert for breakfast is awesome. Especially when it just tastes like a warm cinnamon bun, but is packed full of fruit and other deliciousness instead. 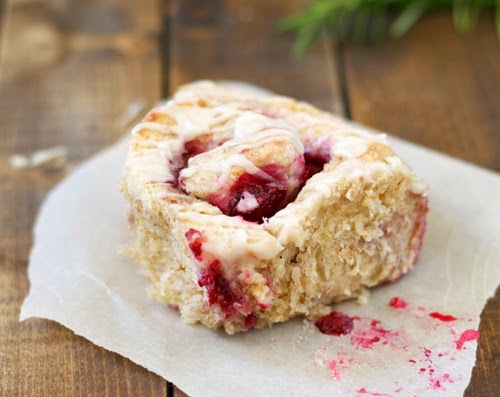 Enter these Breakfast Raspberry Rolls, which fit the bill perfectly. 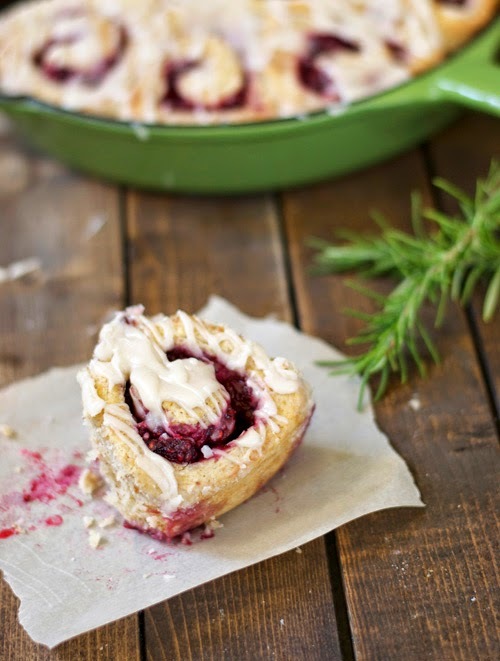 Baked in a skillet, drizzled with a warm vanilla glaze, and a light yet filling centre full of berries and a hint of lemon. If you didn't love breakfast before, you will now. Brush the dough with the melted butter and sprinkle with sugar. Mix the berries and zest with the corn starch and place the mixture top of the dough, leaving a border around the edges. Roll the dough as if it were a jelly roll. Using a serrated knife, cut into 12 pieces and place in a greased skillet pan. (You can also bake in a muffin tin or any baking pan). Bake for 15-20 minutes, or until golden brown. Allow rolls to cool slightly before whisking together the glaze ingredients and pouring it gently over the tops.